Explore historic Bremen from the Hilton Bremen hotel with Airport Bremen 10 minutes' drive away. Keep fit with pool or jogging track and then unwind with a massage or sauna. Sample the French specials at the hotel's L'Oliva restaurant or sip cocktails under the glass ceiling at the Atrium Bar. Ten minutes' walk from the business district, the Hilton Bremen hotel has 13 meeting rooms for up to 350 with wireless internet access and a business center. Later step out onto historic Boettcherstrasse with Shopping Mile, Market Square and many major sights mere blocks away. 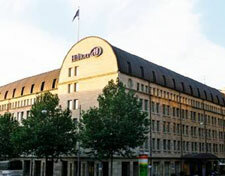 Choose from a Hilton Guest Room, Deluxe Room or Junior Suite at the Hilton Bremen hotel. All rooms have wireless internet access.